Long gone are the days where you were stuck looking at a rather limited range of motherboards to support your brand new processor. The introduction of the LGA 1150 socket from Intel opened up countless possibilities for motherboard creators, including the Z87 and Z97 boards. There’s no question that if you’re looking for that overclocking upper hand, the Z97 is definitely the way to go. 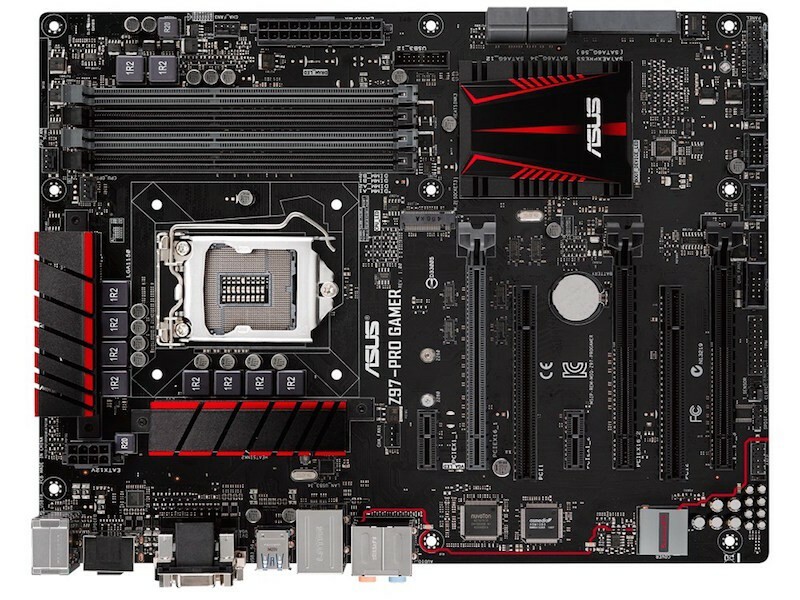 Even the top of the range motherboards have found a way to carve a mid-range, affordable market, and the ASUS Z97 Pro Gamer stands tall here. A notch down from the company’s highly acclaimed (and also extremely expensive) Republic of Gamers range, the Z97 Pro Gamer makes little in terms of concessions and delivers an outstanding performance all round. When you’re looking at the Z97 range as a whole, there’s very little to set boards apart in terms of performance, leaving most decisions up to unique inclusions and rich features. The Z97 Pro Gamer both excels and disappoints in this regard. The motherboard sports out of the box 4K support for one, making it a decent board out of the box for even non-gamers out there. The on-board HDMI slot ensures connection to most modern monitors, supported by the usual DVI and VGA ports as well. That’s coupled with a single ethernet port, but one that makes use of ASUS’ “LANGaurd” technology, which protects it more from surge currents. There’s your standard audio and microphone ports as well, which go hands in hand with the flagship Realtek ALC 1150 codec. The only real disappointment is the number of USB ports on hand, which falls well short of the competition, and well short of what I’m used to. 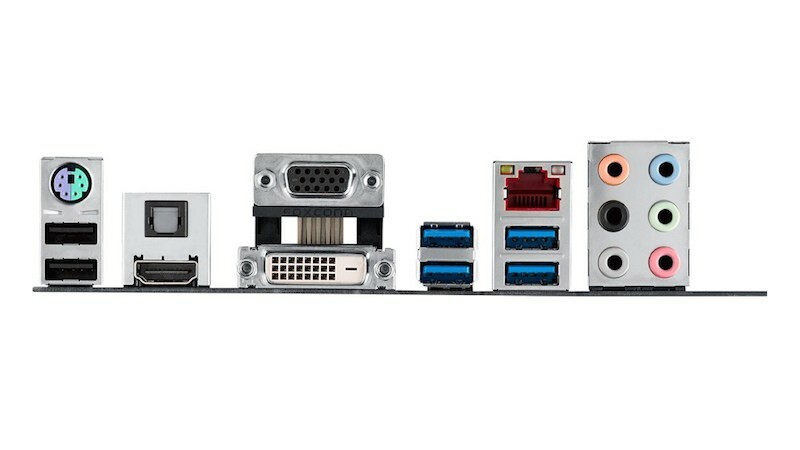 There’s only four USB 3.0 ports, as well as two regular USB 2.0 ports. The whole board bears a striking resemblance to the ASUS ROG range, with a nice black and red finish all round. It’s not as aesthetically pleasing, but that’s partly why the ROG boards cost so much. Make no mistake though – the Z97 Pro Gamer is an attractive looking board, and sports the ports to make it a top-flight competitor. You’ve got high quality audio with PCB isolation, a Intel I218V Gigabit networking chip and support for both CrossFire and SLI right here, as well as a comprehensive storage solution. SATA Express, M.2 and SATA 6Gbps are all catered for here, giving you maximum flexibility if you really need it. Before jumping into any testing, it’s worth noting how streamlined and well thought-out ASUS’ new BIOS is. The simple view is only that in structure. With it I was able to see every single vital piece of information I needed – ranging from CPU voltage all the way down to Fan speeds and profiles. It’s was extremely easy to change settings here, along with the all-in-one overclock solution ASUS provides. In the past these have been wildly unstable, but moving into the Extreme territory not only produced a stable performance bump, but one that made a massive difference in testing (a bit more on that later). The BIOS just works, and it’s a dream to work with if you’re going to be spending hours tweaking overclocking settings. And being marketed as a gaming motherboard, that’s something you’d expect. You’d also probably expect better performance when compared to standard Z97 boards, and at the very least some which justify the price hike. The Z97 Pro Gamer was pitted against our test bench motherboard, the MSI Z97 Gaming 7, in a series of CPU, GPU, memory and speed tests. And just like you’d expect, the vanilla results are nearly identical. Things start to get really interesting when you consider the slight overclock that Extreme Mode provides. Activating it via the BIOS, the settings overclocked the RAM, slightly bummed up the CPU multiplier and put that fans to work. 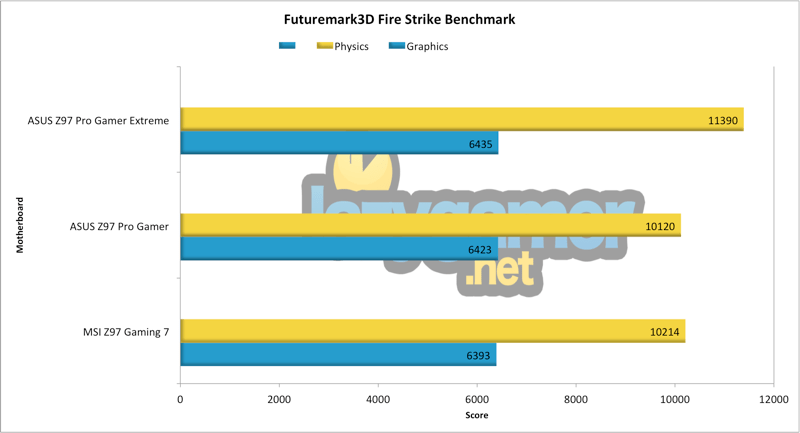 The performance gains were staggering – especially since the CPU only read a 0.1 GHz increase over the stock speeds. Where the Z97 Pro Gamer is pulling all this performance from is a little bit of a mystery, but as you can see the results speak for themselves. 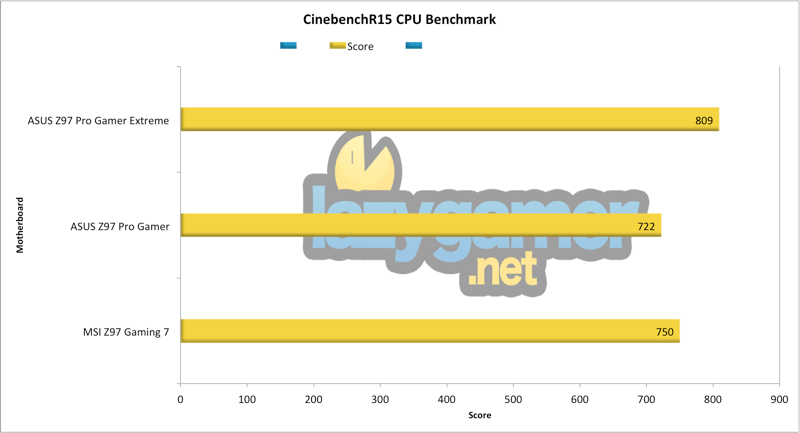 Cinebench15 renders parts of an image individually and produces a score based on how quickly the CPU delivers them. There’s very little to separate the default settings of the ASUS and MSI boards, but the Extreme settings deliver a significant performance with just a slight overclock. wPrime pushes the individual cores of the CPU and times how long it takes for the entire process to execute. A lower score here means better performance, and unsurprisingly it’s the slight overclock that shows the best speed. The vanilla Pro Gamer is, however, markedly slower than our MSI Z97 Gaming 7. 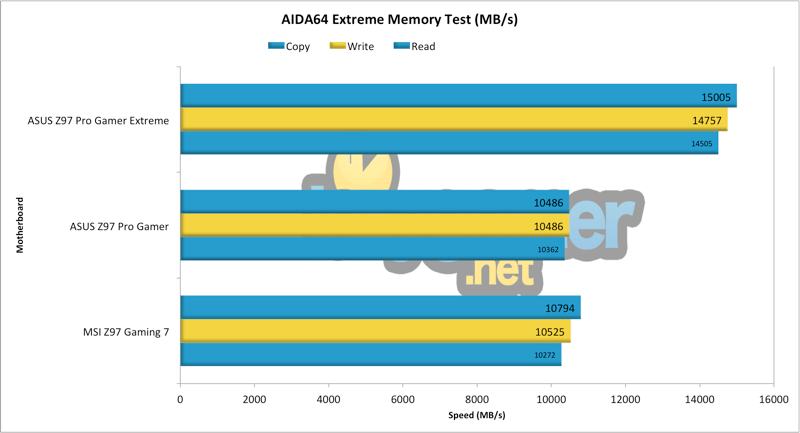 AIDA64 tests the speed of the RAM configuration on the motherboard, measuring Read, Write and Copy speeds. There’s very little to separate all three tests, however the slight overclock delivered by the Extreme Pro Gamer setting results in increased performance. Across the three configurations, there’s little to separate the speed of the graphics card. However, the Extreme ASUS Z97 Pro Gamer configuration clearly pushes the CPU, delivering a greater score and faster performance. The default settings of the Z97 Pro Gamer actually fall slightly short of our benchmark of the MSI Z97 Gaming 7, although those differences are ever so negligible. The same definitely can’t be said for the Pro Gamer in Extreme Mode, where every single test blew the previous two configurations out of the water. A simple switch in the BIOS giving this much performance is an outstanding feature for those looking for a slight overclock without any of the fuss, and it’s great to see that our test bench (at the very least) didn’t buckle under any BSOD issues, as has been the case with past automatic overclocking solutions. But does that alone make the ASUS Z97 Pro Gamer worth it? If you’re staring at the ATX variant, the Pro Gamer will set you back around R3000, which is not technically exorbitant, but not cheap at the same time. As a comparison, that’s already more expensive than the first ROG board you’ll find, and just R200 less than the superior ROG Ranger. I can’t help but feel that the “gaming” suffix has added a little extra weight to the price, where similar boards such as the ASUS Z87 Pro could deliver identical performance at a slighty lower price. 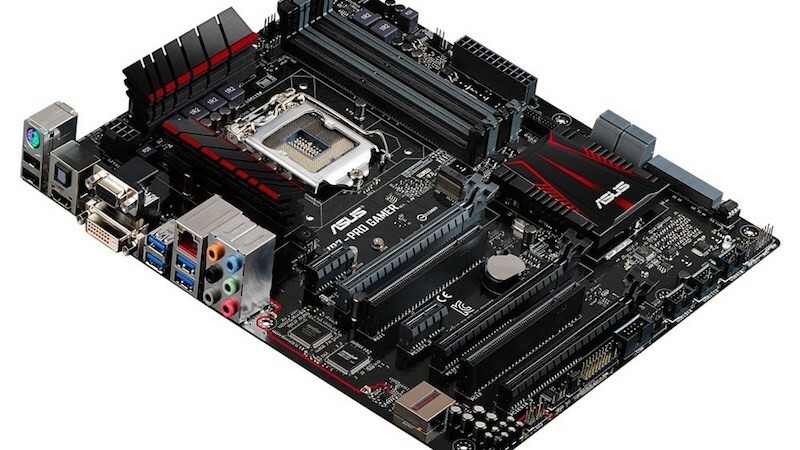 ASUS has a lot of motherboards in their range, and it feels like this was a missed opportunity to create a somewhat more accessible, gaming orientated Z97 board. The ROG range is there for a reason after all. Despite that, for the extra bit you’re getting a full capable board that boast some impressive software, eye catching design and some great audio and storage solutions. The lack of a few extra USB ports is a slight setback, but when you consider it with everything else going on you can be excused for forgetting about it. There’s a lot going on with the ASUS Z97 Pro Gamer, and you’d find it hard to be disappointed. 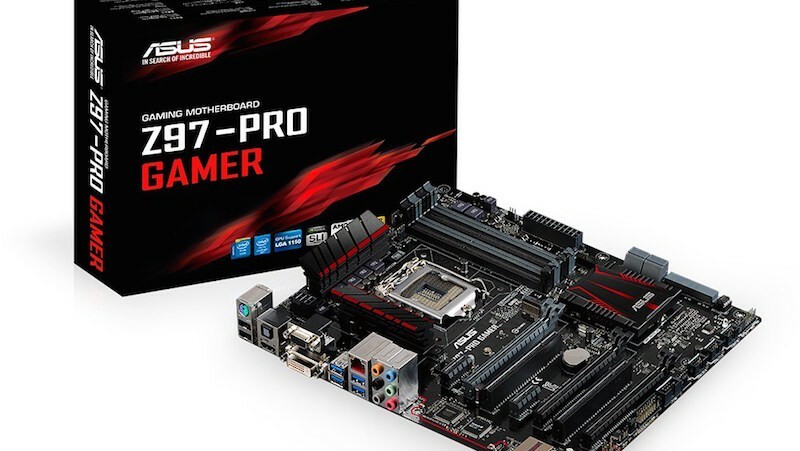 The ASUS Z97 Pro Gamer is a feature rich motherboard that creeps into enthusiast territory with its price, but you'll find it hard to consider it money badly spent.